I looked like I'd been in the fields this morning when I got done. Dirty, sweaty, smiling at all the good produce. Of course, I hadn't been in the fields today. Just at Waverly with The Quiet One and Ms. Vertical. But still, it was hot. Hot like Faulkner where the South envelops you and the air is thick or Bradbury where it's a Martian dawn and there is no air to blunt the sun's rays. And I cook…so hot like the steam that pops out of the oven when you check on the braise. But constant. Enough with the analogies, apropos as they may be. I usually just tell you about the market goods when I cook them, but did I mention it's hot? I might not cook today (statements about blackberry/plum clafoutis-baking in the car after the market to the contrary). And this haul was epic. Summer in full force and a few days of rain over the past few days of high heat have actually created an amazing spread. There's always something that just pops out and catches my eye. This week it was the Swiss Chard and the Twinkle Eggplants. Lucky for me, the purple carrots caught Ms. Vertical's eye and they were with the chard. So Purple peppers, Swiss Chard, Burbank and Yellow Pear Tomatoes, and Purple Carrots from Summer Creek Farm in White Hall hit the bag. Then over one stall to grab Blackberries from Frederick. Gent was, as he should be, proud of his work. "Taste one." Nice. Two pints for $7? Yeah, get in my bag so you can get in my belly (later). "Try one of those too, my own seedless Champagne grapes" Double nice. But no grapes for me this week. Stroll on up the line for more. Purple and green basil, cilantro, and sage (because I have chicken) from my Market-crushes the herb ladies (Hi ladies, y'all have awesome herbs. I'm smitten!). They've had the most consistent quality produce at the market all summer. Gorgeous radishes and red cabbage. Spinach and arugula, mizuna and romaine. So good! Onions and red potatoes from the Bartenfelders (they have land in Baltimore County and down on the Western Shore somewhere). Jalapeno and garlic here too. Lamb and Pork from Woolsey Farms and the M&M Meats crew along with a pint of Black Raspberry ice cream. Good gravy, that ice cream is sooooo good. Real fruit, fun flavors too. Think Chocolate Orange. I'll be getting it next week. I walked by those Twinkle Eggplants one too many times to not buy them. Three orbs of twinkly goodness and $2 later, I was happy. Plums from who knows where because I was beginning to feel the weight of the bags. My ubiquitous pints of shitake and cremini from the Mushroom Gang before heading to the Curry Shack. West Indian Turkey pockets and Moroccan Beef Patties with fig and apricot this week. Ummm, I may have Moroccan-tested the goods before putting everything in the trunk to head back to Federal Hill and drop off the ladies. Milk and bologna from South Mountain Creamery. Ummm, quick request...can you sell some thick cut bologna too? I'll ask in person next week, but I really just want a slab of bologna in a skillet for a few minutes, then on a piece of white bread with mustard. So with a man-purse full of produce with purple carrot tops hanging out the side of the bag over my right shoulder and a market bag full of the meat, milk, and non-veg stuff to accompany my load, we left. Loaded down with Curry Shack for those lunches I don't have time to make. But also loaded down with some of Maryland's produce at its finest. And a dinner in my head. Eggplant and Lamb stewed with basil and cremini. I know it sounds to thick and rich for a heatstroke meal. But it's what I got. Maybe I'll switch it up and do skewers of the eggplant and lamb with a Yellow Pear Tomato and Basil Salad. More summer I s'pose. I'm just a one-pot stew kinda guy. And I saw the word Moroccan at the shack so I was in a tagging frame of mind. Either way, I'll get good grub out of those farmers' hard work and my ability at this point in my life to wake up on a Saturday before 7am. You will approve of this custardy, soft-batter-y, fruity, goodness. Or you're weird. This was the chosen dessert because there were peaches, and blueberries, and I don't trust myself to keep it Mexican and make a flan. I'll have to get over that, because I truly love flan and am becoming quite a stickler for being able to make all my favorite foods myself without much reference to a book or recipe. Until then, you get clafoutis. Add an egg at a time and whisk. Whisk in the milk and butter. Put the fruit in a buttered baking dish. I topped with a bit of turbinado sugar here to get a bit more crispy. Old houses need love. The love of an owner who restores, plants gardens, sits on new porches, and remembers or tries to remember where walls and gates used to be in bygone years. The love of a partner who sees birds and gardens and new views that the family hadn't seen in front of their faces through all the years they'd come. It needs the love of children whose laughter can peel away the years and create a youth in the oldest of hardwood floors, vigor in the frames of doors long ago bent with water and wear. It needs the love of gatherings; parties that bring people together to marvel at it's newel posts, run hands on old door knobs, and stare out across fields at the sturdy old barn. For my part, I think the Farm house gets as much nourishment from eleven guests and three of its family as we each get from the meal and each other. The light glints a bit more brightly off the blue stone countertops, the floors seem richer and warmer to the touch of children's bare feet. It's different than the re-connection of a family around the holiday table (and that happened two days later, so you'll get another story soon). It's not a graduation or a retirement or a reunion. It is, simply, a gathering to tell tales and see old friends, the ones you should see more often. The ones who have the ideas you think are good enough that you muse to no one in particular and everyone who can hear "I hope she takes over the world." Mom had invited a collection of friends and neighbors with the hook of some kitchengeeking. I'm pals with several on the Foosebooks, so they'd seen my posts from afar (and were not happy it was from afar). So the day before we started chopping, and seasoning, and mixing, and blending. We were up early to have a breakfast around the table that would in a few hours time see many sets of hands reaching for spoons and tongs. We browned and sautéed, braised and sliced until there are piles of food full of love, filled with smiling sweat-equity. I couldn't help but smile in return when my sous geek (and executive mom) tasted the salsa with Brandywine tomatoes and cilantro and garlic and red onion and salt and a dash of oil and three jalapenos (two seeded) and looked up with a toothy grin declaring "Oooh, that's spicy. I loooove it." Time is well spent when you cut the tortillas into quarters and fry them yourself so when they're dipped into the guacamole that was simply avocados and cilantro and yellow tomatoes and serrano and lime juice a few minutes before; it makes sense. Of course, in trying to time the quesadillas so they're hot when everyone is putting their plates together, and with a herd of people arriving all at the same time, and with the pork still not shredded and the corn tortillas for tacos still warming in the oven, the chips are almost gone by the time plating is happening. But that's okay. It just means they were as good as they were supposed to be. Sun setting, kitchen cooling, kids getting tired. The stray cat that had showed up the night before had a new home and a very happy 6-year-old owner (and a mother who knew there was a potential new barn cat). The three of us who were staying sat out on a side porch after the crowd had gone and sipped bourbon while the Milky Way blanketed the sky with so many stars it just became bright. Salt and pepper the roast and brown it on all sides. Set aside to rest. Cut the onions into half moons and saute in the same pan you browned the pork. Salt to sweat. Use the liquid to scrape up any bits on the bottom of the pan. Rough chop and add the garlic and saute until the onions are soft and the garlic is fragrant. Place the roast back on top of the onions (fat cap down) and pour the juice over it. The liquid should come halfway up the sides of the roast in the pan. Place in a 300 degree oven and go away for 2 hours. Remove from the oven, flip the roast so the fat cap is up, and put it back in the oven. Walk away for at least another two hours. Shred and serve in a shallow bowl or large platter with accumulated juice and onion pulp ladled over the meat. Warm corn tortillas until soft and keep covered for service. Serve with sliced radishes, diced red onion, lime wedges, and fresh cilantro. Cook the tomatillos, peaches, and onion in a sauce pan with 1-2 cups of water (just enough to almost cover the fruit). Bring to a boil and then remove from heat. Add the ginger and sugar and place in a blender or food processor in batches to blend until smooth. Let cool and taste. Add salt and pepper (and additional sugar) to taste. Now it turns out that taking leftover pork, wrapping it in flour tortillas, smothering it with leftover salsa, adding monterrey jack cheese, and putting it in the oven until the pork is warmed through, the sauce is heated, and the cheese is melted is one tasty alternative service method. Saute the mushrooms, cumin, salt, and pepper, adding oil only if needed. There's liquid in those fungus, let it come out, mix with the cumin, and coat the shrooms. For 8-inch flour tortillas, melt 1 t butter in a skillet, put one tortilla down, placeabout 1/4 cup of mushrooms and 1/8 cup cheese on and top with another tortilla. Flip it once and serve it hot. Keep the dice on the tomato and onion similar. Let it hang out in the fridge for at least 15 minutes to see if you need to add anything (really, this last step helps a lot). This was my favorite combination of the day, mostly because I'd never made it before and it worked just like I thought it would. The quesadillas were earthy with a slight chew and some crispy bits on the edges of the tortillas and the salsa was bright and wet and fresh on top of them. Mix and mash it all together. Make sure you get the lime juice on top of the avocado as soon as it goes in the bowl. Don't crush all the texture out of it. Chunks are okay. They cling to chips well. You'll like it. Serranos are safer than jalapeno here because they are a consistent level of heat. Every jalapeno is a different heat, even two from the same plant. Saute the corn until cooked over medium heat. Turn the burner off and stir half the cilantro through the corn. Let cool completely. Add corn, beans, and the rest of the ingredients to a bowl and stir through. Big cookin' day at the farm. People from all over the county comin' over for supper. Mom enjoying playing sous geek. Some from the garden out back. Some trucked in from the market in the City, some from the local stores. All made with love in the kitchen at the farm house. Slowly. Some prep last night, some chopping after breakfast today. Citrus & Garlic Braised Pork Shoulder Tacos with Ginger, Peach, Tomatillo Salsa. Corn Tortillas. Lime, Radish, Sweet Onion, and Cilantro Garnish. I think we're at 12 people coming over at the moment. We'll see. More on the farm and the ebb and flow of eating here later. Just wanted to induce some drool. Not what you thought it was going to be from the title, is it? It's Smooth Ambler gin. And it's from Lewisburg, WV. This stuff is floral. Seriously. Seems mom prefers more Juniper berry and less flower. I'm just fine with this, on the rocks, with a lime. No tonic required. Seems the gents at Smooth Ambler have a vodka too, and there's talk in the area that they're getting ready to put out a white lightning (young whiskey that hasn't gained any coloration from aging in barrels) and eventually a bourbon too. I know what I'll be getting in my stocking this Christmas! We finished the first pot of coffee and the house guests began to stir. That was likely because mom decided it was time to start frying bacon. A good decision, and one I supported. There were blueberry muffins that had thawed overnight, not mom's favorite work as they were Splenda and as such slightly gummy, but I snarfed mine down. A half loaf of her wheat bread, soft and thick before hitting the toaster and the buttered knife. Some leftover Brandywine slices from last night's dinner. A cranberry & orange marmalade from the Eastern Panhandle and a strawberry jam from the neighbor down the road who bought several pounds of the berries last year and just canned, canned, canned. We thank you Rene. Of course, I made a Bacon and Tomato Sandwich on Wheat Toast. Of course I did. And there were our house guests on their way to DC too. So we talked about the Newseum and the Spy Museum, the National Mall and some of it's hidden treasures like the FDR memorial, Ray's Hell Burgers and Zaytinya, Meskerem and 2 Amys. After breakfast Dad guest disappeared because he was not about to leave the farm without having taken some photos. Everyone else talked about museums and restaurants and travels until he was ready...off they go. Every direction. Whichever porch you've chosen for the evening. You'll see the fog roll in from the mountains. On rainy days like yesterday the fog starts out as tendrils of steam rising from behind a line off beyond the low pastures. Like a stalagmite rising from a cave floor. Wisping and twisting up to touch the clouds above. Then another will start to move, and another. And then there are sheets of the stuff rising from the ridges and roiling in over the pasture to envelop the valley. The fog is just starting to retreat over the fields and back up to the creases and folds in the ridge line above the house as I type this. We watched it roll in last night after dinner with bourbon in hand and we're watching it stream away into the daylight with coffee and a quick check of the outside world on the 'puter. I'm at the farm for a week and will get that view several more times. I'll also have my camera out for some meals I'm sure. I just couldn't be bothered last night, the first at the farm this year and beginning of the first week I've taken here since at least 20 years ago. I awoke this morning with no alarms, no clack-clack-clack, no snooze buttons, and no purpose other than a cup of coffee and a laptop until the other guests rose to the mountain morning and we settled in to fix breakfast. After that there may be a trip to town, or I may begin to put the grill together, or mom and I may dig up a few of the grass patches over larger stones to see what kind of 'wall making stones' we have. I'll keep you posted. I'll likely be writing as the fog rolls in over the fields and chases the deer as they wander up from the creek in the evening. Or maybe I won't get around to writing again until the morning with fresh cup of coffee. Last night it was lamb burgers and some of the homemade mint jelly mom made last year with a few Brandywine tomato slices. Her tomatoes are a week away, so there came to us from Elkins via Kentucky. But there will be Mortgage Lifters and German Stripeys and Cherokee Purples soon. The Mortgage Lifters may reach a pound. The cherries are ready to eat now. I picked eight or ten green peppers yesterday afternoon and ate the last pea that the pea vines were giving up. The potato salad was a mix of Yukon Golds and 'a russet that I needed to use' and had an orange hue because the eggs mom gets from her neighbor are that fresh and the yolks that bright. The cucumbers from the garden were bathed in cilantro with a slight bite from red onion. More cucumbers are probably ready today. A few ears of corn were consumed as a second course and we debated whether they were the advertised "Bi-Color" or instead a variety like "Peaches & Cream." We believe the Elkins store at which the corn was purchased has likely mislabeled this batch (not that it stopped us from eating much corn). I didn't even put butter on mine. Mom's is a late start. But she'll have fresh corn for a Labor Day barbeque, and that's not bad timing. I drove on our mother-road to get back to WV for a visit this weekend. And I had pizza...pizza of the gods. Lola's. Gourmet. Delicious local goods. Patio out back for a gorgeous summer days like yesterday. There will be a line in the summer, and you will have to wait. Mentally prepare. 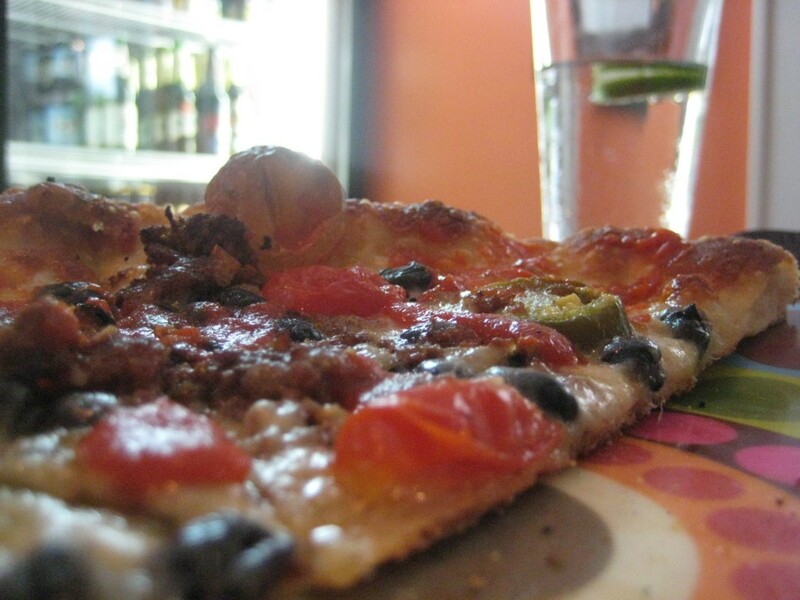 Stand out front with other salivating pizza-wanters. Have a glass of their quality sangria, wine, or a tasty brew. The staff and owners have actually put thought into the beverage options. Ask them. It's a small house, and the city's not big on allowing expansion-y type projects, so they make due with the space they have. Means you'll be close to your neighbors in a happy, romping pizza joint where the folks who live on the hill hob-nob it up with the folks from the East End and even the occasional suburbanite from the valley coming in for a pie after work. What comes out of the kitchen is the key. And dear sweet jeebus it's amazing. Carrie and her kitchen boys are rocking spinach and feta pies with balsamic reduction; Monroe County ground beef and jalapeno with white cheddar cheese on a garlic base with crema; and classic pepperoni with all the salt and grease that glory and pizza require. That's the four cheese with added pepperoni. Bubby says it's perfect. I think the pepperoni covers up the manchego a bit. Either way, he loves it and I sure didn't leave any on the tray. You'll notice here that the cheese is actually applied to FILL the dainty, little, spiced cups of porcine goodness. And that, dear readers, is the special of the day yesterday. Smoked ham with brie and carmelized onions. I mean, ummm, yeah. It was RIGHTEOUS PIZZA. Smoky and salty and sweet. 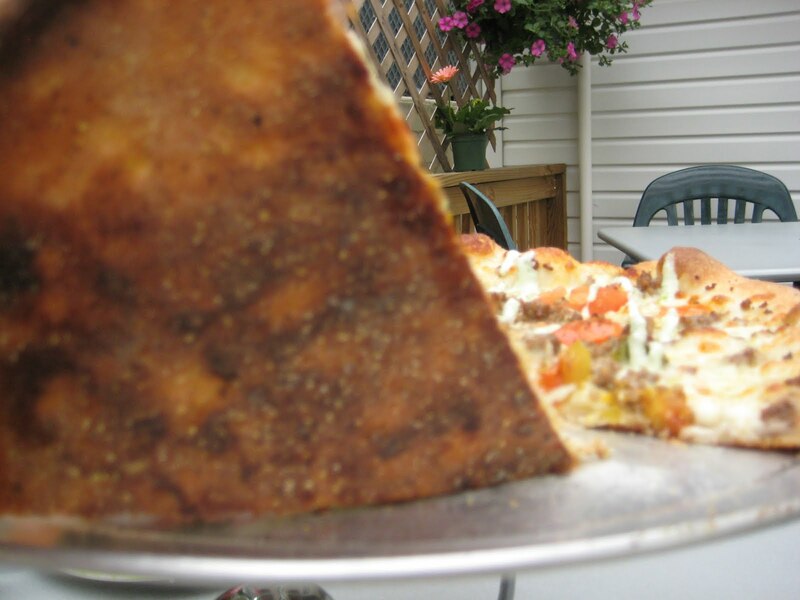 All in one crisp-crust-bottomed explosion of pie. Plus, G was there...so there were shenanigans. And since Blogger finally added the 'Add Video' button back to the new editor so I don't have to switch to the old editor to post hillarity on the web, you will benefit. Please enjoy...death of a slice. And since I have the massive hard drive on the new machine, you can see a few other pies from previous visits. Like in April, when I got back for the first time since October. 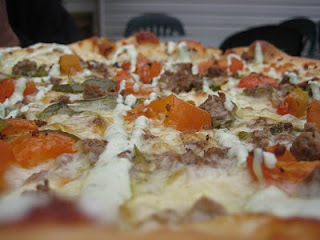 And Bubby and the gang had this jalapeno, tomato, and beef with crema concoction. It's on the regular menu now. They've also done that riff with black beans added too. And here's crust. Thin, chewy, crunchy, charred just the right amount crust. I hope the the Charlestonian peeps still following this enjoy themselves a slice soon.